Welcome to our site! 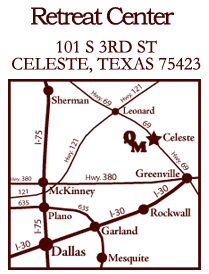 We are THE destination for quilters who want to escape to the peaceful setting of the small town of Celeste, TX. We're located just an hour east of Dallas. 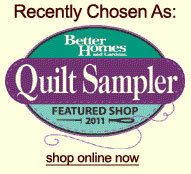 As an added bonus, we are located just behind Quilt Mercantile which was featured in the Spring 2011 Quilt Sampler magazine by Better Homes and Gardens. When you need a break from sewing the store is right next door. Quiltagious Quarters was designed by quilters specifically for sewing, piecing, or anything else that involves fabric! Give us a call at 903-568-8739 and ask for Jennifer Tenney. Want to see what dates we have available or check out upcoming retreats you can join? To flip through our calendar click here. We look forward to hosting your group. Pearl Pereira of P3 Designs is coming in October before Houston International Quilt Market again in 2019! This is her 9th annual trip to Quiltagious Quarters in October 2019. Please let us know if you would like to join a October 2019 retreat. Pearl is coming June 2019 also. Let us know if you want to join one of these retreats. Click here for more information and exact dates. Alice Wilhoit has three retreats scheduled for 2019. Her A-Z of quilting retreats will help you finish most types of quilting projects. She will be here July 11th-14th & Sept. 26th-29th, 2019. Learn about these retreats click here. Eileen Urbanek Let Eileen show you how easy paper piecing really can be. Click here to see 2019 & 2020 dates for her February & August retreats. Her many tibits make this a wonderful way to make your own stunning project. She is well known for teaching beginners to advanced during the same retreat. Click here to see your pattern options. If you DO NOT want to paper piece. Eileen is a skilled instructor for any of the following patterns so join the group to make these also: Stack-n-Wack, One Block Wonder, Jacob's Ladder, String Quilts, and Wonderful One Fabric Quilts. Jackie Holkum Quiltworxs retreat May 30st-June 2nd, 2019. If you have not been able to secure a spot in our previous retreats for Judy's method, we hope you will join Jackie for this retreat offering for 2019. Click here to learn more. Belinda Purvis Ultimate Travel Bag Retreat-looking for 2020 date. Click here to learn more. Finish your custom bag travel bag that fits perfectly under the seat during your travels on an airplane. Click here. Brenda Jeschke has three embroidery retreats in 2019 (April, Sept. & Dec.). Contact us if you want to participate in any of these retreats. We hope you will choose 2019 as the year you learn to use your embroidery machine to make beautiful quilts! For more information about Brenda click here. Brenda has been very popular with quilters wanting to use their embroidery machines for effectively. Jackie Brown has one remaining Machine Quilting Retreat for 2019-- May 17th-19th & December 13th-15th 2019. These retreats are for domestic sewing machines and sit-down long arm units. Click here to learn more. Linda Neal English Paper Piecing retreat August 16th-18th, 2019. Click here for more information. Learn this time honored hand piecing method but use it with a new twist. Several exclusive designs for retreat. We are very excited to bring so many awesome national teachers for you to come learn from at Quiltagious Quarters! Let us know if you have your own favorite teacher we should schedule in 2019/2020.